Why hire a cleaning business consultant? A cleaning service consultant can help you reach your goals, and offer practical advice for whatever stage your business is in. Most business owners are interested in boosting sales and increasing earnings, but there are countless other qualitative as well as quantitative reasons to ask for guidance from a consultant. Whether you are just starting up or have been in operation for years, where your business is concerned, you are an insider. From your perspective, it is impossible to view your business objectively. It's a trees-and-forest situation. A consultant observing your business from the outside is in a position to analyze the systems in use, and evaluate the patterns they see operating. Even if you have not consciously applied a particular plan or method, a consultant can identify your business's processes or modes of action. They can assist you in helping orderliness emerge, so that your business can operate at a new level. Strategy – to improve performance and gain competitive advantage over others. Marketing – for launching and sustaining business; to develop strategies to promote and sell services. Public Relations – to manage the informational flow between the company and the public; to build and maintain a reputation and control persona. Information Technology – to build smart systems designs to create a vigorous business. Social Media – to increase traffic to your website and build a strong online presence. Legal – to identify, prevent, and solve legal problems and provide legal consultation in banking, employment, contracts, real estate and more. Financial – for assistance with investments, taxes and insurance. Consultants can charge exorbitant fees to work one-on-one with clients. Many require a contract and long-term commitment due to the nature of the work. Some analyses are completed in a relatively quick amount of time. Other processes take longer to evaluate. Consultants often request that a client signs a contract so that as the new systems are put into place, there is time to legitimately valuate the changes over time. Sign any contract with full awareness and be alert to your requirements, rights, and responsibilities. On a budget? You may have noticed hybrid consultation models that have emerged online that cater to people with start-ups. Chances are, you will pay far less if you choose this model, while still receiving the quality of information and high-level business coaching that you would if you hired a traditional business consultant. If you are transitioning into self-employment in the cleaning business, you need tracks to follow. You will benefit most from a form of leadership that, importantly, won't get in your way. Look for an affordable alternative to conventional consultation. Also, it is key to find one that does not ask for a long-term commitment. You want to hold the reigns. This type of consultation is really designed for independent people who prefer to have a fair amount self-guidance. Their business will thrive under the guidance of consultants who can blend one-on-one direction with the important features in the types of consultations listed above. Business consultation can be painfully costly – running into thousands of dollars. To avoid getting trapped in a long-term relationship with a conventional business consultant, look for a new consultation model that allows you to determine the level of assistance you get. 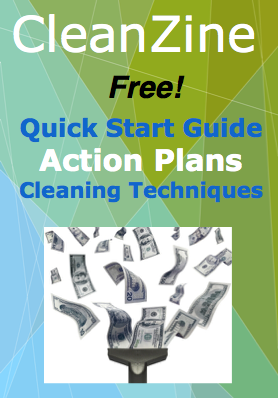 This cleaning-service consultation model is mainly self-guided. The consultants do not pile on the stress by asking to meet with you about every detail, they know it will be more helpful to you if you are in charge of choosing when you want their guidance or not. They will communicate with you personally if your question cannot be answered on their FAQ, or if you find yourself in a sticky situation. You are given all the support you need, and then allowed to conduct your business. If you really need help or guidance, the consultant is there. If you want some sort of consultation in the start-up phase, yet you need to keep start-up expenditures low, look for a customizable consultation model that can help you reach your business goals. The first year is the most risky and the learning curves are generally the steepest. Find a business consultant who is available for you during your start-up phase, to help you transition into self-employment and operating a profitable company. No one knows better than you what sort of assistance would be most helpful, and when. If possible, hire a unique consultant service that understands your needs. You can find one that fits the profile of the newly emerging models described here. In conclusion, look for a business consultant that is largely self-guided, goes above and beyond, and also offers practical and elegant solutions to your startup needs, such as: an interactive online portal, online tools, a cleaning business website, press releases, and promotional-material templates. You can find a cleaning business consultant who provides all of this, and fits your start-up budget.